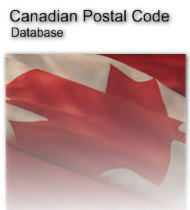 The Lite Edition contains a complete listing of all Canadian postal codes with city and province cross-reference. This is a basic postal code database suitable for applications that need to perform simple validation of Canadian Postal Codes. PostalCode CHAR(7) The six character Postal Code. City VARCHAR(64) The preferred name for the city, town, or unique organization. Province CHAR(2) Two character abbreviation of the province or territory. Copyright © 2002-2018 Quentin Sager Consulting, Inc.